It’s really happening … ??? Unidentified caller: Hello. May I speak to Mr. Craunpixel please? Me: Oh yes that could be me. (brain begins to function better) Yes, yes … that’s definitely me. Unidentified caller: This is Condy from National Geographic calling. Condy: Actually the folks here at National Geographic are quite impressed with your photos and would like to purchase one for the cover of our upcoming issue. Me: Wait a minute is this real. Who asked you to call? Was it Phil? Me: No sorry. I just wasn’t sure this was a legit call. I’m a great fan of National Geographic! Great supporter. Condy: I assure you we’re serious Mr. ah … sorry I’m not sure how to pronounce your name. We found your blog and think you are an amazingly talented photographer. We would like to purchase the rights to a photo of your choice for $5,000. Me: Well if you put it that way, why not? You are very persuasive. Just to be clear, I’m not dreaming this, right? Condy: Are you sure you’re OK? This call is really happening … never! And I’m good with that. Really! Of course if they were desperate, I might take the call and generously spend their money! National Geographic recognition used to be on my secret bucket list – after all, they are often idolized as the photography gold standard. However, I checked my bucket list the other day and was surprised to discover that entry was gone. I think it might have disappeared after I was challenged by another blogger to think carefully why I take photos. My first thot was visualizing the euphoria of making it to National Geographic. Then I thot of how I would feel about photography two weeks later. I decided it would be pretty much the same as now. I suppose that’s one of the reasons why I’ve never sent my photos to any magazines. There’s something satisfying about thoroughly enjoying my photos and sharing a few without having to chase sales, awards or recognition. I’m regularly amused by how many professional photographers describe themselves as an “award winning photographer.” Is there a secret club? Somehow I find it oddly satisfying to proudly proclaim I’ve won no awards. Wait a minute, I think I hear that motorcycle ring tone … gotta go! I hope they call you someday, your photos are so wonderful ! I had putting this post together. Ha, ha ~ that is very, very good! You are so correct in that Nat Geo is pretty much the gold standard when it comes to quality photos and I dream of such a moment as well, but you say it well it does not change who we are as photographers. We always will chase that elusive shot, and the most important thing is to enjoy the process of that chase ~ and it is clear you enjoy it well (and capture more than your share too!). If you agree, then it’s settled! Yes the chase for the elusive shot continues – the next good one really will be my best one! Though today it didn’t happen. It’s an interesting journey we find ourselves on sometimes. It is interesting to get requests to use pictures. I had a professional wedding photographer ask if she could use a fireworks picture that I took, and a small town newspaper asked to use another picture. I also had a picture featured in a Buzz Feed – 26 Nando’s Problems We All Know To Be True. Incredibly, they actually linked to the post on my site and I had a few visits. Good for you. It’s great when it works out like that. Nat Geo be damned. You are in a club all your own, Lyle. But you, and your good humour, keep coming back along with some insight on recognition that I will remember. As for wit – I’m still trying to keep up! I was going out on a bit of a limb on this one (and then had to find photos) but glad you still found it funny. Appreciate the feedback. I LOVE this post!! Really, you had me 100% convinced, and if I worked for National Geographic, I would highly recommend they make you this offer! Happy to hear! Now all I need to do is somehow get you hired on at NG! For a second I was very excited for you. I thought you really got the call. Your work is professional quality. Two days? Well that certainly didn’t take long! Many people have spent a lot longer before coming to the same conclusion. Excellent point about blogging. In another era we wouldn’t have been able to do this without some great expenditure – now everyone can do it and the audience is all over the place. Still we have the opportunity for great fun and connections. Oh, forgot to mention… I’m DLing that motorcycle ringtone now! Well I believed it was really a thing that happened. Your photos are as good or better then most anything I see out there including NG. A unique to you and me coffee mug – now that is thotful! It would almost be like a secret club until you gave away some more. Now I’m going to have to change my profile and about section but it’s all worth it! No better way to ruin a prank call than to anticipate it – I knew what you were thinking! I know that bighorn sheep image could easily be on the cover. Thoughtful & funny post as usual Lyle! That bighorn sheep sure surprised me by running right up beside me so I ended up with a completely different image than I planned (like that’s never happened before!). It has grown on me over time. Glad you enjoyed my thots and found the funny. I recently posted about quitting the endeavor to chase sales. I have always photographed for myself first and foremost. But right behind that was the idea that it would be nice to receive the occasional check from and editor at a magazine as the ultimate compliment to the quality of my photographic endeavors. After all, what higher praise than a signature at the bottom of a check? Well, the highest praise is the self-satisfaction that comes with the creation of a piece of art which brings one total satisfaction. That in itself is quite a difficult task. Ansel Adams said that if one could make 6 significant images a year then one has done well. It’s a tough job, but how can we not keep doing it whether there is a cash reward or not? I have settled in to showing my prints at local venues or an occasional competition and being pleasantly surprised if some nice neighbor person decides to hang one of my images on his or her wall. I’ll sell through my website or Fine Art America to an individual if interest is there. But every day that I make an image is me doing it for myself. The rest is gravy. I remember that post well and identified with the general sentiment. It’s not easy settling on a different course but I hope it works for you (and me). Your comments about self satisfaction ring so true. I know that I haven’t given that the value it deserves in the past but I’m planning to the right that ship. From reading the comments on your post, you have had some nice gravy in the past as well. Stunningly funny … and I missed it? How unfortunate! Glad you liked the post even if I was leading you astray! I completely agree that money is only one measure of success and there are far more important ones. Beauty and education sound pretty good to me – thanks for that. Well for awhile there I was pretty excited for you. But you’ve found the reason for your photography and that’s all that matters when one gets right down to it. Congrats. Well said on both counts. It’s been an interesting journey to get to this point but I’m prone to take the scenic route! It certainly is generous of you to be excited for my success. My heart was pounding for you–no, really!–as I started to read, and was looking forward to seeing that incredible portrait of the ram on a future cover, but I salute your senses of humor and creativity. More, please! I am honoured that you would care that much about my success! I really like that shot and pleased to hear you do too. Humour and creativity are interesting compatriots – as long as the ideas keep coming, I will keep sharing. Your post cracked me up! Not only are you an… award-winning photographer 😉 Lyle, but you are also funny as hell when you write! 😀 Keep it up. I just can’t get away from this whole award thing! Funny. My quest for humour is only strengthened knowing it landed with you. I appreciate that. That bighorn had his own sense of humour. He was high up on cliff and I was shooting away when he surprised me by running right toward me and passed by too close for my long lens. It’s almost like he knew I couldn’t get the shot I planned from there but I still caught his eye on the way by. Great post. Of anyone, you deserve a cover at Nat Geo. If they don’t find you, you should apply for one of their site photo shoots. Location shooting would be very cool. I do think that doing it for a magazine would take the fun out of it though since what I have read, they have very specific requests for images on a shoot. That would be too much pressure since photographing wildlife is not like other genres of photography that can be planned to the smallest detail. I follow Moose Peterson, a Nat Geo photographer, and he often says how hard it is to get wildlife shots off their list. That’s a great sentiment and I appreciate it. I have some sense of the difficulties those photographers endure to get their shots and it would put a lot of pressure on the fun quotient! Enjoying the moments is a key part of why I do photography so I’ve come to peace with sticking with that. It’s a wonderful hobby that brings joy. Well you had me fooled as well, though now you have me concerned to go with it. Does this mean that when I come to Canada to write a whole series of articles that you would not be interested in being the paid photographer? If I get that offer from you, it would be pretty much the same thing as the National Geographic call! Nothing to worry about. 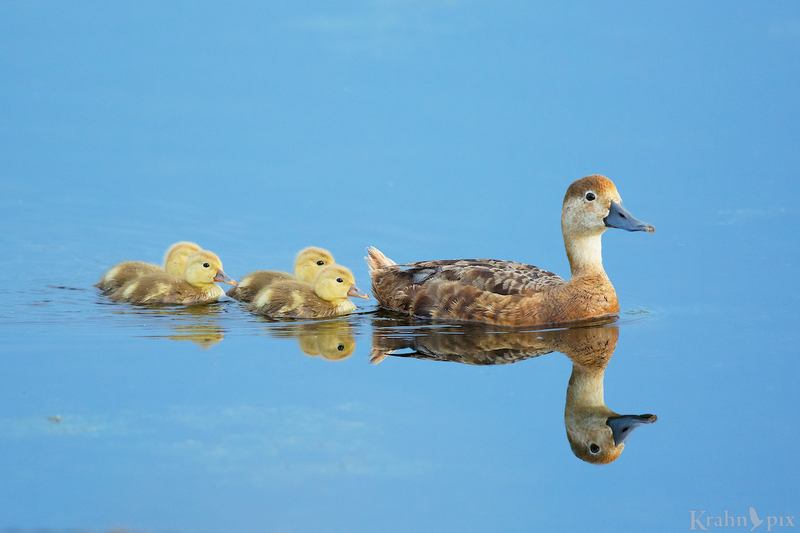 Glad you enjoy that little duck family – they are special ones. Well, you had me going! You’re photos are so stunning, they could definitely be featured in any number of publications, including National Geographic. I’m a sucker for reflective shots. Add in some ducklings….. stunning. Thanks for the humorous tale and stunning photos. I was so excited when I found those ducklings and realized conditions were right to get those reflections. It was a rare opportunity for me. I’m glad you share the beauty and think I’m good enough to get you going on my crazy story! My attraction to humour is insatiable – the trick is finding people who share it! I love the idea of dreams coming true and so happy to hear of your sister. I truly appreciate your vote of confidence … and sense of humour. Your last line had me chuckling. I can be a bit of outlier! Glad I’m not the only one with finger trouble – I fixed it. So at first I was like, oh my goodness, this is so awesome! My smile plastered across my face and oh so happy for you and your fabulous photography. Ha! And, then read your comments about “never . . . ,” what a teaser! But you know Lyle more than NG should be running to your door step – your portfolio is second to none. I love your work, for pleasure or pay, doesn’t matter – it works in so many ways. The opening shot of the duck and ducklings is beautiful. Can’t believe how blue the water was and reflections perfect. Great post! Enjoy your anonymity while you still have it! After a few years of waiting for my duckling shots, I was so excited to catch them on a gorgeous, calm summer evening when reflections and everything came together. I guess that’s the way it works. As you know, finally getting photos like these are special to me and keeps me going. The pleasure is great pay in itself. And then there’s the bonus of hearing about you smiling for my potential success – that is really quite something. Thank you. Your anonymity comment had me smiling! And man, that is the most adorable duck family I’ve ever seen. Which is saying something, since all duckling are inherently adorable. I tried for years to get a good duckling shot and never pulled it off till late summer this past year. It was a late batch so I’m hoping they survived. Inherently adorable sounds like a great description of those little gaffers. And they have it! Great to hear that I have things in common with a National Geographic photographer! That is rarefied air. I like very much those ducklings and their mother. They look perfect on that calm water. In the second photo, is it you that black point from the right side of the eye? I think there are some mountains reflected. In the third photo I like all shades of green, especially those from background. About that call, nice try. But I wonder how it would be if one day you will really receive a call from them. About your name… I must confess, when I’m writing the address of your website, almost all the time I write khranpix photography…and there are no results…so, I have to search your blog in my WordPress Reader.. I tried for many years to get a duckling shot so it was exciting and surprising when this opportunity suddenly happened. Photography is like that. The Rocky Mountain Sheep was taken in the mountains so that’s possible. I think if I really got that call, I would suspect that someone was playing games with me! Sorry about the spelling of my name. I knew when I started that would be an issue (so not the best name!) but I liked the sound of it and for some reason couldn’t resist. Now here it is in all its confusion. At least I can have fun mocking it! I remembered the one name change you did but not the other. I appreciate all that information – I wasn’t aware of all that. I must confess that I have taken a few runs at that whole SEO thing but it’s a lot less interesting to me than taking photos or writing blogs so it tends to get neglected. However, I am pleased to learn what I thot was a liability could still work me! I am much more comfortable in the world of blogging than Twitter, FaceBook or Tumblr (I was going to delete my Tumblr account and just today discovered a good wildlife photographer just started up there – sheesh). What’s next? Costner’s line is one of my favourites … and no one else could deliver it better. Glad you enjoyed the humour. My only trouble is that sometimes people take me seriously. With your testimony of said ribbon, I officially declare you part of the secret club! Then again I have no idea what I’m talking about but at least it has one member. Yay, a club of one! I am truly a legend in my own mind. You are an amazing person, photographer and writer, we’ve known that all along. Please keep taking the pictures and thanks for sharing your talent with us. Person, photographer and writer is high praise indeed. I’ve always appreciated your friendship and support. Thanks. Congratulations, Lyle! Well deserved call from NG! Your photos are outstanding! OK – you fooled me! But don’t be surprised if they really do call you! My unusual sense of humour and writing can do that! I don’t know why people put up with me sometimes but thanks for hanging in there. As for surprised – you bet I would be! That FANTASTIC!!! And most deserving. Congratulations! Like winning in a lottery! 🙂 That would have paid for my new camera, but – I’m not living in such surroundings! But you really deserved this!!! Your pictures ar – like he said – quite outstanding!!! Well, ‘award-winning’ makes you better than the zillion self-acclaimed professional photographers out there 😉 After all it’s a competitive business. I think your pictures should be in National Geographic magazines, seriously! I really hope you make it one day. You’re absolutely right about the competitive nature of the business and so many people are struggling to find a foothold. Self-described ‘professionals’ are another one of the ways people are trying. The important thing for me is that people like you enjoy my photos – thanks for that and the best wishes. I think you’ve hit the nail on the head with any creative endeavor – how will I feel about it after I’ve achieved something with it? While I’ve matured in my attitudes about writing, I remember years ago when I went through a homemade card hobby. Coworkers saw my work and asked to buy some. I started creating them for money and not only did I not enjoy doing it, the end product was decidedly not something I liked. It completely took the joy out of it. Some things have more worth than their market value. Still, I’d like to see your photos in a glossy magazine, if only to brag that “I knew you when”. Although, I’m not sure anybody really brags about knowing a photographer, do they? I don’t think anyone brags about knowing a photographer but writers – that’s a whole different story. Just remember this conversation in your future famous years! You were the inspiration for this post with your tough questions! Thanks again.